Day 5 dawns with an air of excitement: lots happening today and still in Scotland, but we’re going to England. The Fish-Griffiths forecast gives us changeable weather. Yet another cop out, cover-all-bases type of report. Still, we pack waterproofs and mentally adjust for potential rain. It’s only (!) 83 miles, so we start at 9am after Peter’s done a radio interview for Peavey’s promotion supporting Three Men on a Bike. The first 30 miles passed quickly, fairly flat, but we had important business en route so a couple of stops had been planned. The first took us to Gretna Green. A stop like no other we’d ever done: Simon finally popped the question to Jules and taking advantage of Scottish law the two were wed. Here we all are, celebrating this joyous moment. I think the rest of us got carried away and held hands too….not sure what Peter was doing? Moments later we cycled into England, the first stop on the new couple’s honeymoon. Mind you, I think in the intervening five mins they’d had their first row, Peter was definitely feeling the frosty atmosphere. After the initial euphoria of seeing the sign and photos etc. reality took a few minutes to sink in, but then the realisation that we’d just cycled the length of Scotland was really quite moving. Our 4+ days in Scotland had been tough but had brought the team together. The wind, weather and mountainous challenges had been immense, something none of us will ever forget. We’ve all learned a lot about Scotland, even picking up a few Scottish words. We would regularly have drivers slow down, open their windows and share all kinds of different Scottish dialect. I’m sure they were encouraging us (?) and that the accompanying hand signals were underlining their passionate support. As we crossed into England, spirits were high, the sun came out and the road surfaces improved dramatically. We sped through Carlisle and stopped at 50 miles just outside Penrith for lunch. The gastronomic delights (they get better every day – thanks Ruth!) were only topped by the new Olympic sport (to be announced for Rio) of Jelly Bean catching. Here’s Simon in full swing – can you spot the bean? 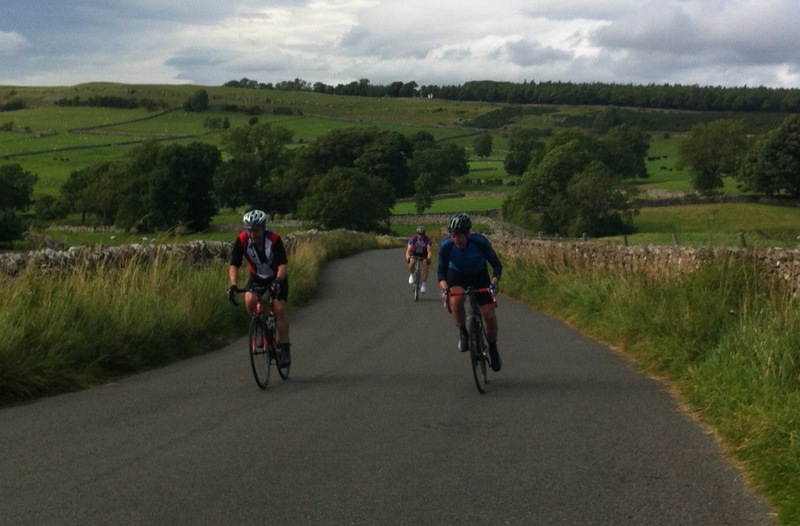 The real work today came this afternoon with our climb through Shap and Shap Fell. Peter has seen a new lease of life today and has put his new triple to heavy use, typically in the highest gear to make it as hard as possible, ‘cos that’s what Peter does. Here he is racing his way to Gold at the end of a lovely climb in Shap. Even I enjoyed this one. No podium finish for me though! When we arrive at each hotel there’s a set external routine to logistics operations. In short, bike into room (as long as James hasn’t got to reception first), back to van, bags into room. Back to van to pick up equipment crate, agree meeting time for dinner, back to room. Door to room, three different types of entry systems so far. Enter room, first question: do I have a couch or chair? A couch is essential for laying out a large heavy case. Chair is useless, and means case on floor, not good. How big is the room? Will the bike fit there? If not, only goes at a particular angle to not obscure desk. Sockets, vital for charging phones, Garmins (bike computers), laptops etc, are they accessible above desk or hidden on the floor? We prefer on the desk. Bathroom, always identical, but slight variations in the taps. I know, I know, this is sounding slightly bonkers, but trust me after five nights doing this, it starts to get to you. Some of us are even getting stressed about the position of the waste bin, which has at least two homes. Lastly, lighting – some variety here and depends largely on whether your room had the 2010 refit or 2009. All in all, Premier Inns are great places to stay but you are probably best advised to not attempt nine stays back to back. Anyway, back to the ride. 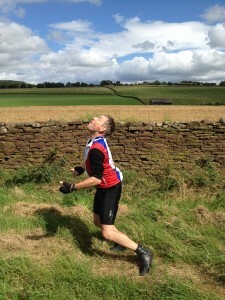 When we got to the top of Shap Fell, we knew/thought that the last 12 miles were downhill. Well, they weren’t. There were a couple of sharp surprise ascents, the wind got up and then the heavens opened. We were in a hurry too as Peter had an urgent appointment to gets his eyebrows waxed or something (true – and not a euphemism in sight). There was a huge sense of relief for all of us as we coasted into Kendal. Relief of many kinds. For me, it was that my knee had held out. Some pain, but it got me here. For the team it was the excitement of knowing that Rose was going to the launderette. Clean clothes at last and relief that Griffiths could finally change his one pair of shorts…. Half way and 452 miles done: all aboard for Crewe. Print article This entry was posted by admin on August 22, 2012 at 6:44 am, and is filed under 2012 ride. Follow any responses to this post through RSS 2.0. You can leave a response or trackback from your own site.